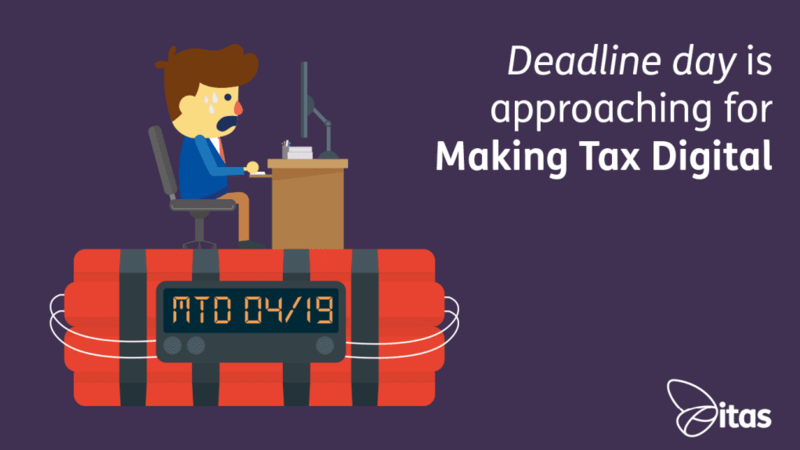 The Making Tax Digital (MTD) switchover deadline is approaching fast! From April 2019, the vast majority of VAT registered businesses will be required to keep digital financial records and submit returns via MTD-compatible software. It means that from the April deadline, you will no longer be able to submit returns manually via the HMRC gateway. There’s no getting away from it – time to pull our heads out of the sand, embrace change and cuddle up to progress. There’s no need to panic! but it is time to take action and get yourself prepared for the change. It’ll be worth it, honest! What is the point of MTD? MTD is being rolled out by the government to make tax submissions simpler and reduce the administrative strain it causes. In other words, the whole process will become much more manageable and less time consuming, with much more first-time submission successes – Great! In short, tax administration is evolving to become more efficient, effective and easier to get right first time. From HMRC’s point of view, they will be hoping to significantly reduce compliance interventions that come from common human errors, such as transposition errors and miscalculations, when manually submitting. With recent tax gap figures showing an annual shortfall of £9 billion for the Exchequer resulting from these errors, there is little wonder why the government is enforcing the MTD rollout. Do I really need to comply with MTD? MTD will apply to most VAT registered businesses with turnover equal to or above the VAT threshold, currently set at £85K. This will be compulsory from April 2019! This means you will need to keep your financial records digitally and submit your returns via MTD-compatible software. There’s no need to change your routine to quarterly reporting in order to comply, so monthly and annual submissions are still acceptable. The only exception is for a small minority of businesses with more complex requirements, approximately 3.5% of affected organisations. These will be deferred by HMRC for six months until October 2019. If you’re a VAT registered business with turnover below the threshold then you don’t have to comply. However, the new rules could still benefit your company, so don’t dismiss MTD just yet. It’s worth noting that MTD will not apply to taxes other than VAT until April 2020 at the earliest. How will MTD benefit my business? The intention of MTD is to make life easier for individuals and businesses when it comes to tax returns and general financial management. Accurate and timely records are key components of what HMRC is trying to achieve. Ultimately, this will have a positive for all sides by ensuring that tax is processed with the utmost accuracy, ease, and efficiency. Besides the hours that would be saved by digitising your accounts, MTD will help prevent late filing and payment by providing alerts when your return deadlines are approaching. How do I become MTD compliant? Don’t worry, the itas team can help you identify the best software for your business needs. We can help you through the implementation as well as offer training and continuous support along the way. It’s vital that you start considering the options available that are HMRC compatible as soon as possible. Feel free to get in touch to talk through your requirements. We can help you find the software that’s right for your business needs. So long as you have updated Sage 200cloud to any version released from April 2018, it will be compatible with HMRC software. That’s okay, Sage understand that not every customer will be in the position to upgrade before the MTD deadline. That’s why there is a Submission Module available to purchase right now, allowing you to comply with MTD in the short-term until you’re ready to migrate to a later version. Remember, it’s not too late! But don’t delay it any longer. Whether you’re looking to upgrade, migrate from alternative software or have no software in place at all, we can help. Contact us and one of the team will be happy to help get your business ready for Making Tax Digital. Check out the top 10 FAQs for MTD here.